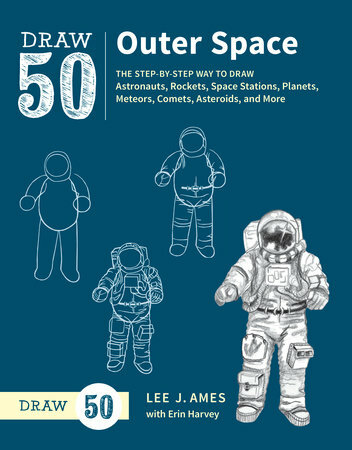 In this new installment of Lee J. Ames’s beloved Draw 50 series, readers will find easy-to-follow, step-by-step lessons for outer space drawing. In each lesson, six wordless steps provide everything needed to master drawing all kinds of planets, moons, comets, and meteors, as well as astronauts, rockets, spaceships, and other aspects–both natural and man made–related to charting the cosmos. We will be starting an astronomy series soon in our homeschool so I thought this book would be perfect for my older boys. Both love to draw. Some kids thrive on creating their own creations while others, such as my eldest son, thrives off of "how to draw" books such as this one. He loves to learn how to draw new objects and surprisingly takes what he earns and then includes it in his future doodles. He is a quick learner and an excellent artist, this is the perfect book for him! Disclaimer: This book was received by Blogging For Books in exchange for an honest review.